Kevin Pace is working on a painting that he won’t allow anyone to see: not his children; not his best friend, Richard; not even his wife, Linda. The painting is a canvas of twelve feet by twenty-one feet (and three inches) that is covered entirely in shades of blue. It may be his masterpiece or it may not; he doesn’t know or, more accurately, doesn’t care. What Kevin does care about are the events of the past. Ten years ago he had an affair with a young watercolorist in Paris. Kevin relates this event with a dispassionate air, even a bit of puzzlement. It’s not clear to him why he had the affair, but he can’t let it go. In the more distant past of the late seventies, Kevin and Richard traveled to El Salvador on the verge of war to retrieve Richard’s drug-dealing brother, who had gone missing without explanation. As the events of the past intersect with the present, Kevin struggles to justify the sacrifices he’s made for his art and the secrets he’s kept from his wife. 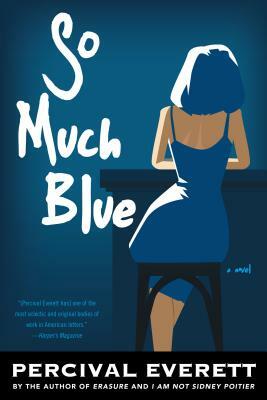 So Much Blue features Percival Everett at his best, and his deadpan humor and insightful commentary about the artistic life culminate in a brilliantly readable new novel.